In this column, coaches at the high school, college and pro level will provide insight, tips and strategy designed to help you improve — whether you play defensive back, coach defensive backs, or just want to learn more about what DBs do on the field. 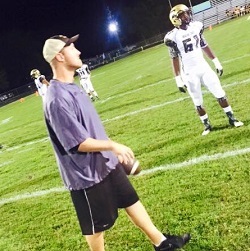 First up: Devin Russell, secondary coach at Treasure Coast High School in Port St. Lucie, Fla.
After going winless in 2014, Treasure Coast finished 7-3 this season and advanced to the Class 8A regional quarterfinals in Russell’s first year on staff. A defense that gave up 41.1 points per game prior to his arrival allowed just 15.9 points per game with Russell — a former high school safety — overseeing the defensive backs. 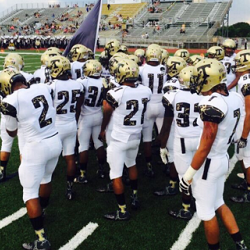 I am extremely proud of the turnaround this year at Treasure Coast; last year we were 0-9, and finished this year 7-3 and made it to the playoffs. A large part of our success was better continuity on offense as well as a greater focus on run defense. My belief in regards to bettering a defense is to stop the run and control the pass, while keeping things simple. This year we originally started out playing a 30 stack front with a Cover 2 robber coverage behind. The idea was to give a Cover 2 shell and have a robber to be an extra run player as well as rob twins and trips sets, and play the high hole versus doubles. This front and coverage helped us greatly, and provided a unique look that played well against our first two opponents. In game-planning for our fourth game we decided to add a 3-4 look with a base Cover 2 behind. We made this change to get a 7-man box as well have 4 linebackers to reroute the receivers. This helped us stick to our belief of stopping the run while controlling the pass. The next phase of our transition was to go to 4-3 quarters approach due to the team we were facing being a deep threat passing team. We kept our box integrity with 7 men, and were able to play 4 verts and defend some of their other deep concepts. The final install we had was what we stuck with for the remainder of the season and into the playoffs. That was a 4-3 Cover 2 read concept in it’s simplest sense. We had our corners reading #2: If he went flat, you play him; if he goes vert, you carry him with safety support. We became a dangerous and versatile defense, being able to use a wide variety of fronts and coverages to help us become more and more successful. In the beginning of the season, when deciding who will start at each position and how the depth chart would look, I had traits for the corners and safeties I was looking for. For the corners in our base defense (a Cover 2 look), their main responsibility was going to be force players with flat responsibility. With these general responsibilities I wanted a strong, physical player who had some quickness. Speed was not top priority because their area of coverage was short range, but they needed to be physical in the run game. For Cover 2 safeties, I need players who are fast and smart. The reason being is, they need to play deep halves, and in some situations be able to cover two receivers by mid-pointing them. The intelligence aspect comes in handy because they need to know route combinations and where their help is coming from on any given play. They are not needed in the run much, only to provide support versus a crack replacement. Even as we morphed our coverages, the same four started — they were just adjusted by their pre-snap alignment to play to their strengthens, i.e., in our quarters scheme we aligned them 10 yards off to ensure they were not beat on a deep route by #1. The most important position in our base defense was the robber. We need someone who is quick enough to play the pass, yet be a box defender. For this position we went with our smartest and fastest linebacker. This position is a tall task with a lot of responsibility as you must understand formations to know your pass responsibility as well as the run fits in front of you to provide run support where needed. The first cover we will start with is Cover 1. This is a man coverage with one deep defender. I am not a huge fan of man coverage, as it takes a lot of focus on one coverage. It also does not give you the flexibility to change like zone coverage. The basic alignment for the corner is head-up or an outside shade and 6-8 yards off. They will each have the #1 receiver with safety help over the top. Their depth can be adjusted by calling “Press,” which would bring them to 3 yards off the receiver and allow them to play tighter. This adjustment would be good in a short-yardage situation or with a blitz call. The safeties in Cover 1 will either play a deep zone as the deep safety or come down and play #2 strong side man-for-man about 4 yards off the line of scrimmage (LOS), and in an outside shade. The deep safety is 10-12 yards off the line of scrimmage and over top of the center. The second coverage we will look at is my favorite, Cover 2. I love Cover 2 because it is versatile and can be taught relativity easily. This coverage, unlike Cover 1, can be altered easily depending on down and distance. The basic alignment is to have the corner outside the WRs and 6-8 yards off the LOS. Their main goal should be to keep outside leverage and funnel the WRs into the safeties while dropping until a flat threat appears. This is the key to a successful coverage, as the hashes must be protected due to their vulnerability. The safeties will align on the hashes and 12 yards off the LOS. They must work the hashes to ensure the seams are protected, while looking for WRs being funneled to them. Their prime pass responsibility is goalpost to sideline. When we go base Cover 2, I always preach to work the hashes, to make sure we are protecting our weaknesses as best we can. The next coverage is Cover 3. This is a 3-deep zone with one safety playing the curl/flat area, and the other playing a deep third of the field. The corners will align in an outside leverage and 8-10 yards off the LOS. They will be responsible for deep thirds, ideally from hash to sidelines while the free safety will play hash to hash. The rotated safety will align to the strong side and be outside the last man on the LOS. He will work the curl area until a flat threat appears. This coverage can be adjusted with various calls like a Sky, Cloud, Bail or Press. The final coverage we will discuss is Cover 4. This to some is a prevent coverage and also a read coverage. As a prevent defense — with the corners and the safeties playing deep zones — their responsibility is to split the field. Corners play hash to sideline while safeties are responsible for goalpost to hashes. The corners align 10 yards off the LOS and outside leverage of the WRs. The safeties will be aligned 12 yards off the LOS and on the hashes. I want to thank you all for your time, and look forward to providing more content to help you continue to learn in regards to the secondary. Feel free to follow me on Twitter at @coach_russell87 and also on Facebook under Devin Russell.